THAT two of the three recipients of this year’s Cape Winemakers Guild bursaries for oenology and viticulture students at Stellenbosch University are women is a great thing for “team ladies”, says Tsholofelo Segone (who is one of them). Segone, who grew up in the winelands but had drunk no wine until she began studying the subject, says her role models include winemakers Andrea Freeborough (Bergkelder), Kathy Jordan (Jordan Wines), Carmen Stevens (Amani Vineyards), Ntsiki Biyela (Stellekaya Wines), Maria Botha (Solms-Delta) and Praisy Dlamini, who was the first woman protégé in the guild’s associated three-year protégé programme. Dlamini now makes Fleur du Cap wines for Bergkelder. “I’m inspired by women in the wine industry and I believe we need more women because we are simply the best,” she (kind of) teases, adding that she’d like to achieve within the next 10 years the recognition her role models have. It’s the fifth year the guild has offered student bursaries in its Billy Hofmeyr Seta Bursary Programme, which provides undergraduates with financial support during their final year of study. Once they have their degrees, they can apply to become a protégé on the three-year programme. The initiative is named for guild founding chairman Hofmeyr, who convened the first meeting of the organisation on his farm, Welgemeend near Klapmuts in 1982. The other two recipients of this year’s student bursaries are Natasha Williams and Rudger van Wyk. Female versus male winemaker debates not withstanding, the three agree that, aside from assisting them by funding their final year of study, the bursaries place them in esteemed company with the Cape Winemakers Guild. It is an association of 45 of the country’s finest winemakers who are recognised for their high standards of craftsmanship. Moreover, with attention focused on their potential, the beneficiaries of the bursaries have something of a head start in the race to become fully fledged protégés once they’ve graduated, which would mean being mentored by members of the Cape Winemakers Guild. The recipient of last year’s student bursary, Wade Sander, was welcomed to the protégé programme in December and began his internship with Etienne le Riche near Stellenbosch this year. Le Riche is considered South Africa’s “King of Cabernet”. His 2003 Le Riche Cabernet Reserve is included in the book, 1001 Wines You Must Try Before You Die. Being mentored by someone like Le Riche is what drives the students to achieve their best in their final year. They need to achieve an academic aggregate of at least 60% and demonstrate an excellent aptitude for winemaking to be considered for the protégé programme. The three acknowledge that the student bursary provides them with good prospects. “The bursary means a lot to me,” says Van Wyk, who grew up in George and followed his elder brother into viniculture. For Williams, who grew up surrounded by vineyards in Saron in the Tulbagh region, news that she was among the recipients of a bursary motivated her to work even harder. The protégé programme was launched in 2006 under the auspices of the Nedbank Cape Winemakers Guild Development Trust with the objective of expediting transformation in the wine industry by cultivating and nurturing winemakers from previously disadvantaged groups. In addition to the aforementioned Sander-Le Riche partnership, the Cape Winemakers Guild protégé programme for 2013 teamed Thornton Pillay with Ernie Els Wines winemaker Louis Strydom, and Ricardo Cloete with Abrie Beeslaar of Kanonkop. The recruitment of Sander, Pillay and Cloete in 2013 means there are now seven protégés at various stages of the programme (The others are Philani Shongwe, Elmarie Botes, Chandre Petersen and Heinrich Kulsen). In addition to working with the wines made by their mentors, the protégés have the opportunity to make their own wine during their three-year internships thanks to sponsorships from barrel, glass and cork suppliers. The long-term vision is that these protégés eventually will be invited to become full members of the guild, and certainly this ambition is shared by the three students. “I have big dreams of becoming an extraordinary winemaker and would like to experiment with different blends and bring something unique to the industry, both locally and internationally,” says Segone. Van Wyk dreams of one day owning a wine farm and helping students who are not in the financial position to study to fulfil their dreams. 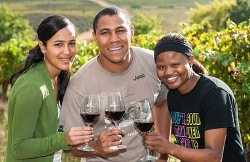 “In SA, winemaking is a scarce skill that offers a lot of opportunities. I want to enlighten people from all communities about the wine industry and as a future winemaker encourage the youth to make winemaking their career,” he says. He’s fascinated by the craft because wines produced from the same grapes can differ depending on the style the winemaker applies: “That tells me a lot depends on the winemaker’s character and the decisions he or she makes. Like Van Wyk, she would also like to own a wine farm one day. She’s mindful though, of the importance of continuously growing and evolving, not only as a winemaker but also a marketer. “I think it is extremely important to keep the interests of your target market at heart by producing top quality wines — especially if you want to make a name for yourself in the industry,” she says. And that, concludes Segone, is what it’s all about, whether you’re in “team ladies” or not.